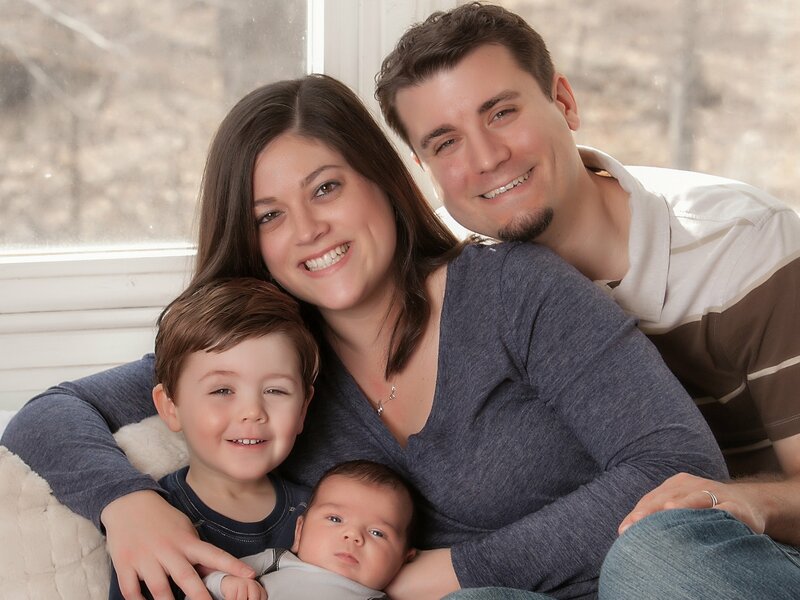 Please help us help this mom of two little boys! Four years ago, Rachelle began experiencing severe fatigue, weakness, and numbness in her legs and feet. And it was growing worse. Like MS, CIDP attacks the nervous system, and without treatment, Rachelle would be wheelchair bound, and eventually her internal organs would shut down one by one. For the past three years, Rachelle has undergone monthly IVIG treatments that halt the disease for 3 weeks, but it cannot cure it. So far, these have saved Rachelle’s life, but the side effects are so severe that for up to a week after each treatment, she cannot work or care for her two sons, David (4 years old) and Daniel (1 year old). Without the new procedure, she will have to continue these monthly infusions for the remainder of her life. Even though insurance has agreed to pay for the costly procedure, the Johnson family cannot afford the costs associated with traveling & staying in Chicago, and being out of work for the time the transplant takes. But together, we can make this possible! These kids have never experienced life with their mom healthy and whole. Let’s give them that chance! Thanks so much for your support and for spreading the word for this family. I have relapsed and will begin my IVIG infusions this week. Our blog is the best place to stay up to date. I’m 6 months post transplant!!! Can you believe it?! You can go to our blog to get a more detailed update. Thanks for helping us get our life back! We are in the middle of the transplant! Today was my last day of chemo! Wednesday I celebrate my new stem cell birthday!!! I’m in Chicago! Pretesting Week begins tomorrow with a very busy day. Then a Chest X Ray and lots of Blood work. The kids are gone, the house is quiet. The calm before the storm. These next few months are going to test me in ways I’ve not been tested. I’m as ready as I can be. We are one week away from the beginning to this journey! So much to do, so little time. Biggest thing on my to do list? Get photos to take with me. Those are essential to my souls survival. Here is a video that truly shows what I go through every month and why we are so desperate for this life saving transplant. I’m getting ready! April 26th is my first trip out to Chicago. That week will consist of pre-testing (blood work, MRIs, echo…). They want to make sure my body can handle the transplant without any difficulty. Items and bags are starting to be gathered. Last minute clothing items needed for the transplant are being ordered and sewn. Preparations for the boys are getting nailed down. It’s all coming together. Something that seemed like an impossibility is becoming a reality! Some frequently asked questions, answered. Reset Rachelle’s immune system so that it no longer attacks the myelin in her nerves. If successful, we hope for a long-term remission that will halt progression. A secondary goal is for improvement of Rachelle’s current symptoms. Once the auto-immune process is stopped, her body has the ability to partially repair the scarring in her legs, feet & hands. While many patients experience some degree of improvement, it is impossible to predict Rachelle’s results. Of course, improvements would be awesome but most important is to stop progression. It’s called hematopoietic stem-cell transplantation (HSCT). The words “stem-cell” and “transplant” are a bit misleading. This is not the type of regenerative treatment that we all read about in the news nor is Rachelle getting cells from a donor. The positive results from this treatment are produced by using chemotherapy to very strongly suppress Rachelle’s immune system. The objective is to kill the components of Rachelle’s immune system that have the “memory” to target her myelin. By erasing this “immune memory” the hope is to essentially stop the auto-immune disease process. Once the immune system is suppressed with chemo, Rachelle will get a transfusion of her own stem-cells which help facilitate the healing of her immune system. These stem-cells are collected prior to the chemo and stored until she is ready for the infusion. Hence, the name “hematopoietic stem-cell transplantation” which means “getting a transplant of your own stem-cells”. Is this the same treatment used for cancer? That is an excellent question! The answer is yes and no. Rachelle’s treatment is based on the procedure used to treat various forms of cancer. These procedures are called bone marrow transplants or stem-cell transplants. Developed 40 years ago, 50,000 cancer patients per year undergo these procedures. For cancer, the goal is to fully kill the entire immune system including the bone marrow where immune cells are produced. To accomplish this, radiation is often used in conjunction with a more powerful chemotherapy cocktail. These protocols are called “myeloablative” and patients often require a bone marrow transplant from a donor to survive. Unlike cancer, the protocol used to treat CIDP is less toxic. For CIDP, the target is only the “immune memory” and trials have shown that this can be accomplished with a less toxic protocol. Therefore, Rachelle’s treatment is considered “non-myeloablative” (also referred to as transplant-lite) which is less risky than most cancer protocols. Simply stated, Rachelle is getting chemo. She will experience many of the side-effects you know about including losing her hair. There are two phases to the treatment – harvest and transplant. Harvest (10 days): First, Rachelle’s body is stimulated to produce the type of stem-cells that will later help her heal. A single dose of chemo is used to get the production of stem-cells going. After giving her body a week to produce as many stem cells as possible, the “stemmies” are harvested by filtering her blood through a machine. Her stem-cells are then purified, frozen and stored. Transplant (3 Weeks): Rachelle will be admitted to Northwestern hospital and will be inpatient for the entire duration of this phase. The transplant starts with “conditioning” which is the process of suppressing (killing) her immune system with chemo. For 5 days Rachelle will get infusions of cyclophosphamide and rATG. After a day of rest, Rachelle’s harvested stem-cells are infused back into her. This is considered the “transplant”. For the next few weeks, Rachelle will remain in isolation in the hospital as we wait for immune system to start to recover (“engraftment”). This is the phase when she is most at risk of infection since she essentially has no immune system. Once Rachelle’s blood levels start to show signs of recovery she will come home. For the first several months she will need to be very careful as her immune system will still be compromised. She will avoid sick people, crowds, be careful of what she eats, etc. Eventually, her new immune system will strengthen and the risk of infection subsides. However, it will take as long as a year to fully recover from the effects of the treatment. During this time she will most likely be tired, experience some pain and a few other side effects. We are still waiting to hear back from CareFirst. I did contact Paula at Northwestern last Thursday asking how long this part usually takes. She said it varies greatly but that we should be assigned a case worker this week! So things will be moving. Continuing to pray that they approve us on the first request. I am so thankful for all of the love and support we have been shown. You are all helping make this dream of a healthy life, possible. Thanks for being on this journey with us. I got the phone call today. We spoke about what Dr. Allen suggested, getting SCIG more frequently instead of IVIG all at once every few weeks. Then Dr. Burt asked me what I wanted. I told him I wanted to be well again. He told me that I do not entirely meet the trial criteria. But (there is a but), he said he’d be willing to treat me OFF STUDY!!! That’s right!!! I get to have the treatment! I get to be well! I get to be healed! I get to live again! There is still one major hurdle that we have to overcome, insurance approval. I will start a new policy effective Jan. 1. We pray and hope that there isn’t a battle for coverage. He didn’t say no…but he didn’t say yes. Tomorrow morning, at 7:00 AM we will meet with the Neurologist and have the EMG & NCV tests done. These are always very painful as they have to electrify the nerve and muscle to test the velocity and strength of each. From what others (who have gone before me) have said, Dr Allen needs to get the best picture of what quality of life looks like. Thankfully, I printed out extra copies of my daily struggles and things I can no longer do. Tuesday next week is when I will find out if I’ve been accepted into the program. Oh the wait. My first appt. is today at 4:30 (5:30 EST) and is with Dr. Burt. He is the one who will determine if I am given the transplant. We will likely find out in a week if we are officially accepted into the trial. Insurance is still not responding about whether or not they will cover the evaluation costs. I spoke with the Chicago staff this morning and the cost for self pay for the evaluation will be $2,100! This won’t include the MRI or Spinal tap, those will be done later if I’m officially accepted. By going now, we will be able to make better decisions about whether I need to change health insurance for the transplant. Flights are booked! We are going to Chicago!!! Evaluation Dates have been scheduled for 12/03 – 12/05 with Dr. Burt & Dr. Allen. This will be a time for her to ask questions, learn more about the HSCT procedure and get further testing done. They will perform various procedures on her to determine if she is a candidate for HSCT. Those tests will include an MRI, EMG, NCV & various lab orders. Please be praying for safe travel, Rachelle’s body to be cooperative as she handles the stress, the Dr.’s and nurses we will be meeting and a clear answer as to whether or not HSCT is for us. Rachelle & Jesse, We will be keeping you both and your family in our prayers as you undergo this procedure. God will bring you out on the other side with flying colors. God Bless. Prayers for peace and healing. God is good. Keeping you and your beautiful family in our prayers! Hopeful! Praying for low side effects from treatment, protection from infections, and healing! Also for continued care for your family. Rachelle and Jesse, Your beautiful family is in our prayers. We serve an awesome God who can do awesome things! Praying for God's blessings upon this. We're with you! Rachelle and Jessie, Gosh, so surprised and sorry to hear of all this. I'm asking our Father for wisdom and supernatural intervention and lots of hope and strength. May His grace be upon you. We are praying for you Jesse & Rachelle! I am praying for you my beautiful friend! Love and miss you lots!! I'll be praying for your entire family between 12/3-5. Can't wait to hear the good results! Rachelle and Jesse, we're excited for December and will be praying for you guys!